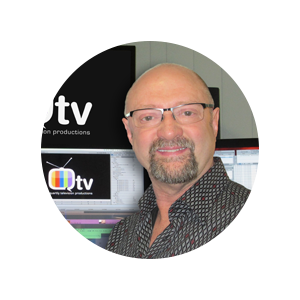 BishopMedia’s production manager and editor is Steve Quartly, an industry-recognised and award winning professional who helped to pioneer 3D cinema advertising in Australia. Devoting more than 25 years in WA video production, Steve has been the supervising senior director and technical producer at Channel 7 Perth responsible for creating many of WA’s most popular television shows and documentaries as well as station promotions, community service spots and commercials. For many years Steve was the technical director of Perth’s annual Sky Show Australia Day fireworks display and he assists in the production and technical direction of Telethon. Steve helped to develop 3D cinema advertising in Australia, creating new digital technology and as such, is recognised as a leader in this highly technical and sought-after production field.